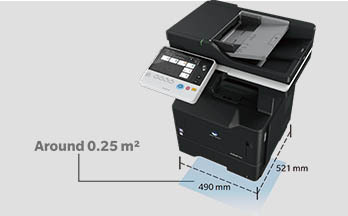 Delivers high speed printing and copying at 40 PPM on A4 size paper. Designed to boost your efficiency, Pick up first page within 8.5 seconds. Some spaces just aren’t large enough for a full size MFP. With a footprint of only around 0.25 m2, this compact bizhub MFP is small enough to keep on your desktop or in any convenient space while still offering a wide range of great features. bizhub 4052 is also ideal as sub machines in a larger network of MFPs.Its wireless capability makes it possible to install them wherever is convenient for you, without the need to install extra LAN wiring. 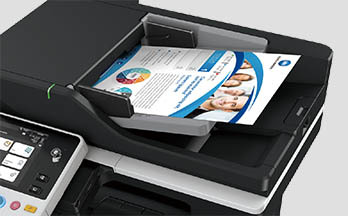 Add the optional finisher to your unit to easily prepare documents and staple up to twenty sheets at once. Copy the front and back of small documents onto one sheet of A4 paper. Ideal for copying licenses, business cards or other small documents without wasting paper. 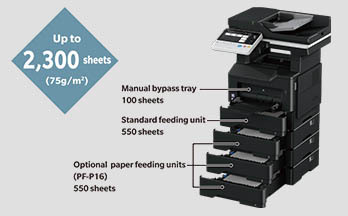 Increase the standard 550-sheet paper capacity with optional paper feed units. A 100-sheet manual bypass tray or up to three addtional 550- and/or 250-sheet paper feeding units can be installed to increase paper capacity while keeping the same compact footprint. 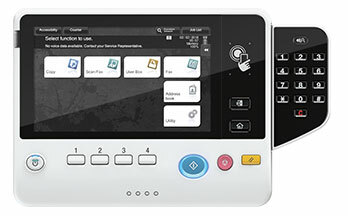 Konica minolta design smart user interface,INFO-palette shines on tha large 7-inch electrostatics touch pannel. Easy to understand and even easier to use,the smartphone-like operability makes controlling your bizhub simple. Easily scan even large documents with single-side scanning at 30 ipm in colour, and 47 ipm in black and white. 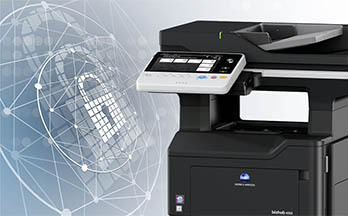 What’s more, thanks to the high-speed DADF (duplexing automatic document feeder) equipped as standard, the speed doesn’t change when you need to scan double sided documents. Process up to 60 ipm in colour and 94 ipm in black and white. Optional authentication systems allow administrators to set restrictions on copying, printing, scanning and faxing, so you can create an authentication system that suits your office needs. i-Option expands the potential of your bizhub. Easily install extensions, such as barcode fonts, Unicode fonts, OCR fonts and ThinPrint functionality. 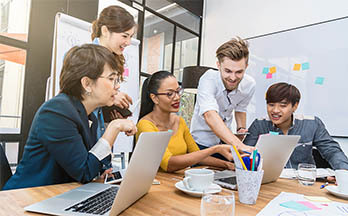 Scan documents into a range of formats including three different types of PDF, TIFF, JPEG and pptx, and then share it in the way that suits you. 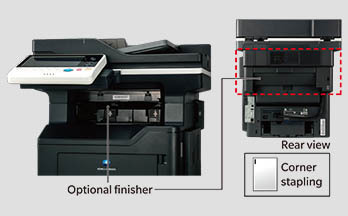 Data stored on a USB memory device can be printed directly from the USB port on the front of the bizhub’s control panel. 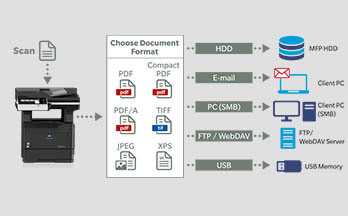 Print from a range of document and image formats including DOCX, PPTX, PDF, JPEG, PNG and TIFF. Security is crucial, no matter what size your business is. These bizhub models meet IEEE 2600.1 international protection profile standards. 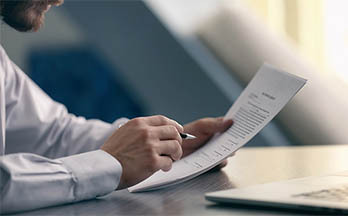 All security features have been independently evaluated and certified ISO 15408 EAL3 compliant, so you can print in confidence, knowing your documents are secure. The bizhub 4052 has a mobile touch area on the operation panel is with equipped Near Field Communication (NFC) technology . Pairing*1 is available from Android Devices via PageScope Mobile. Print a file by selecting it in PageScope Mobile and holding the Android device over the Mobile Touch Area. 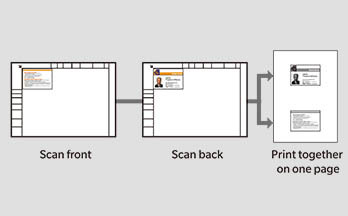 Scan*2 documents to save data. If authentication is required, the user can log in by holding an Android device over the Mobile Touch Area. *1 Android Devices must have Android OS 4.4 or higher. *2 A wireless LAN environment is required. Users can search for and register*3 nearby bizhub units in PageScope Mobile*4 via Bluetooth Low Energy (LE)*5 technology. If user authentication is required, log in using Bluetooth LE. 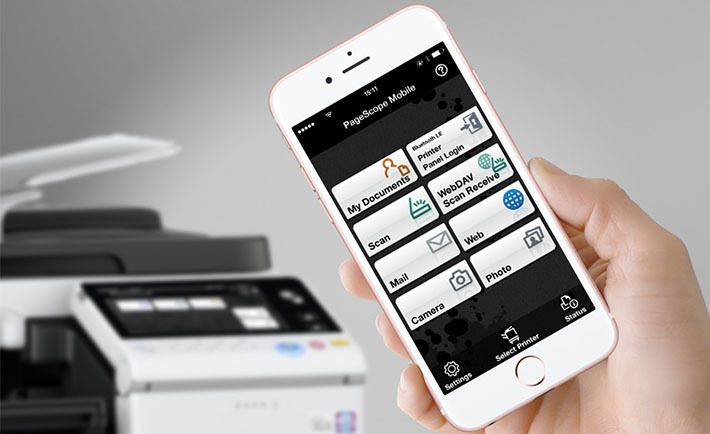 Easily print*3 or scan*3 via wireless LAN by selecting a bizhub unit that is registered in PageScope Mobile. *3 A wireless LAN environment is required. *4 PageScope Mobile for iPhone/iPad version 5.0 or higher is required. *5 The optional Local kit EK-P06 is required. Print and scan directly to and from your smartphone or tablet. This application enables printing directly to bizhub via a wireless LAN from Anroid 4.4 or later installed devices. Print from any compatible Apple IOS device on your company’s wireless LAN using Airprint-Apple’s standard printing systems . It is compatible with iOS 4.2 and Mac OS 10.7 or later. 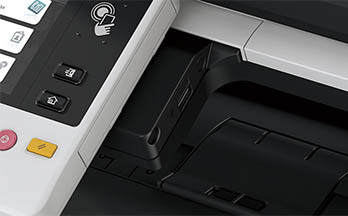 Wireless printing technology provided by Mopria Alliance . 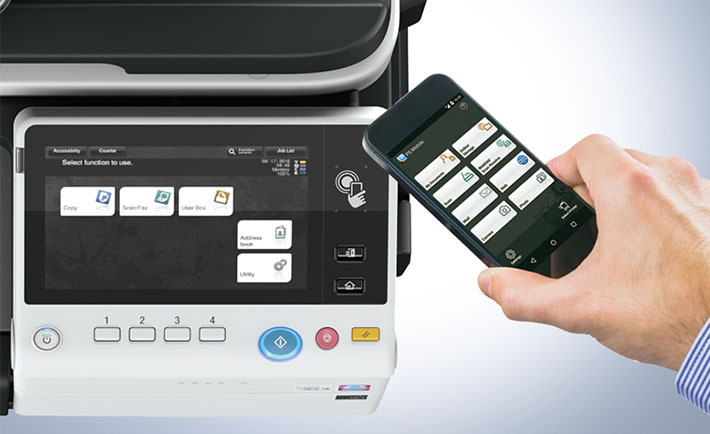 It allows user to print from devices installed with android 4.4 or later. With the compatible software installed, you can print from any location via the internet regardless OS or Devices types. * Google cloud print setup and Google account registration are required.